For the price, I'm very happy with the purchase, and it is lovely Sonia dresser from Cosmos Furniture to look at. Arrived in perfect condition, easy to assemble and matches the rest of the furniture in my bedroom. Very sturdy and good quality. I bought the whole set in this. The weight is heavy when moving! That said, it is a solid piece of furniture and we love it. It looks great and functions just fine for my tween's bedroom. Came a day before expected, in perfect condition, and my husband & I put it together. I actually enjoy this Sonia collection from Cosmos Furniture. I Bought this dresser for my sister's bedroom. 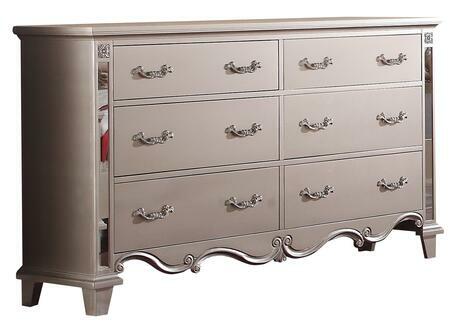 The dresser is nice, very strong, sturdy, good quality, big and it looks very elegant. Beautiful and solid piece of furniture which was promptly delivered. Considering a second one for another bedroom. Amazing beautiful, great quality, SOOO Happy!